First things first: click an ad! These great companies are keeping this site afloat. Help them out, get to know their products, and click! Alright. Great news! I’m finally running another giveaway! I don’t get to offer up great gear to you guys super often, so I’d like to extend a very special thank you to Dream Cymbals and my man, Libor Hadrava. This is a beautiful instrument, and I’m truly honored to pass it along to one of you. UPDATE: Contest has closed! To enter for your chance to win the Dream Cymbals 10” Stack, scroll down to the bottom of this page, and complete the entry form. This contest is only valid for residents of the U.S. (sorry). Contest ends July 2, 2014 at 11:59PM ET. I’ll select a winner at random from the completed entries on July 3, and notify the winner directly via email (please check spam folders or set up a safe sender tag for dgrblog@gmail.com). Alright, let’s get to the review. Designed in conjunction with super shredder/craftsman/Czech mate, Libor Hadrava, Dream’s cymbal stacks (also available in 14” – review coming soon) feature a Contact series splash (or crash) and a Pang China-type. The cymbals can obviously be played independently of one another, but are most effective when paired together. Individually, each component operates as a very serviceable instrument. The splash is tight, punchy and bright enough to cut, but backs every note up with enough dark, warm wash to add some depth. Similarly, the Pang is extremely sharp and has a ton of projection, but settles with a collection of intriguingly separated overtones that I found really fun to play around with. One of the really nice things about these cymbal stacks is that they can be adjusted in a number of different ways to help you find the sound you’re after. In the default setup (at least, the way it’s photographed), the Pang sits on top of the splash with the bells fitting neatly together. The flanged edge of the Pang faces upward, offering a sharp attack with a tight burst of static-y, yet warm wash to follow. But, the orientation can be swapped so the bottom of the splash is facing upward (serving as the striking surface), which mellows the sound bit and opens up the wash for just a second longer. The difference isn’t outrageous, but it’s definitely noticeable. Changing the tension on your cymbal stand offers another opportunity for tailoring the sound. Tighten up the wingnut, and you’ll get a super cutting, staccato bark and a few extra overtones to back it up. On the other end, a very loose setting opens the stack up for a sloshy, trash-filled “whush” that worked great as an 8th note bed for hip hop and pop grooves. In Libor’s demo videos, he seems to favor a much looser setting, and I can totally see why. It’s a fun sound that really has some momentum behind it. Beyond those two standard configurations, the stack can also be played with the Contact splash face up and on top for a very different sound. 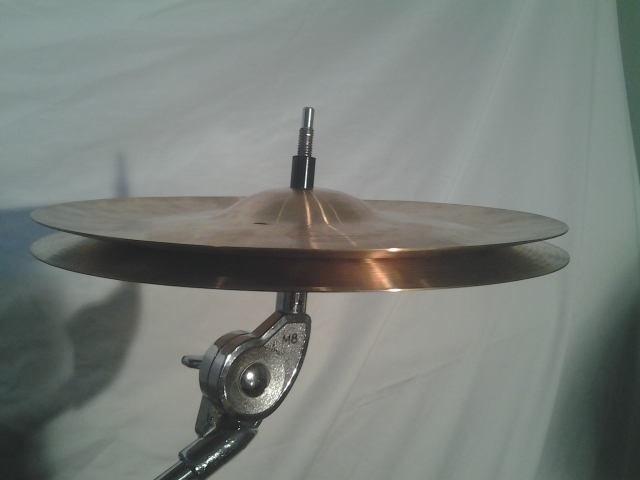 With the Pang either bell down (so the flanged edge matches the contour of the splash’s edge – see pic below), the pair sound like a set of very trashy hi-hats. I really liked this setup because it offered some extra definition, and the opportunity to create some great 16th note driven grooves. 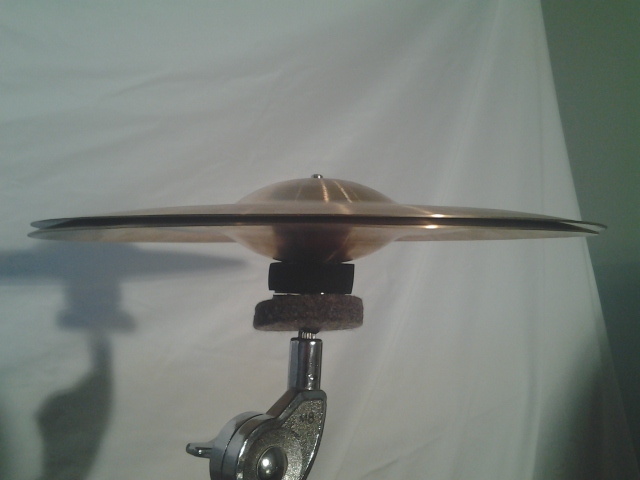 Flip the Pang (bell side up, so the flanged edge meets the splash edge – see pic below), and you’ll get a very different sound. It’s still hi-hat-ish, but there’s a great open “chup” behind the attack – especially when played loose on the stand. It’s got a warm, funky, vintage feel that made for an excellent accent in medium-volume situations when a full crash was too much. I found I really favored the two latter configurations the most for two reasons. First, as much as I enjoyed the more explosive trashy response of playing the stack with one edge up, I (personally) was just able to find more use for the tighter, less abrasive sounds. That’s not to say that they’re better sounds, they just fit my playing style more comfortably. But, that’s one of the great benefits of an instrument like this; you can adjust it to suit whatever you need. The second reason I liked the splash-up setups a little more was because they weren’t chewing up my sticks. Unfortunately, playing one of these stacks with a cymbal edge facing up means murdering your stick shanks with every note. It’s like striking a butter knife. Obviously, that’s a problem common to all stacks like this, so it shouldn’t be seen as an indictment of the Dream product in particular. I really enjoyed the Dream 10” Stack. It’s a versatile, customizable instrument that offers a lot of options. Stacks are becoming more and more popular among working drummers because they’re a nice alternative to conventional crashes and splashes, and they also work well in situations where electronically generated sounds need to be replicated. Libor’s 10” Stack fits both those roles extremely well. And, for less than $130, it’s an absolute steal. UPDATED: Contest has closed! To enter for your chance to win the Dream Cymbals 10” Stack, complete the entry form below. This contest is only valid for residents of the U.S. (sorry). Contest ends July 2, 2014 at 11:59PM ET. I’ll select a winner at random from the completed entries on July 3, and notify the winner directly via email (please check spam folders or set up a safe sender tag for dgrblog@gmail.com). *Note: Your email address will not be used in or added to any email list and you will not receive unwanted messages from this site. You will only receive an email notification from Drum Gear Review if you are selected as the winner. Very cool! What are you using for a ride cymbal in your setup? Thanks Robert. That’s a Dream Bliss ride that I’ve had for many years. One of my all-time favorites.